Previous entry First post of 2018! The Red is "Best in Category." You can win this with any US or World Catehory. You win this for having the set with the highest score (and most pics where tie breaking is needed). For US sets, this includes/counts PCGS coins that are grandfathered in from before 2017. 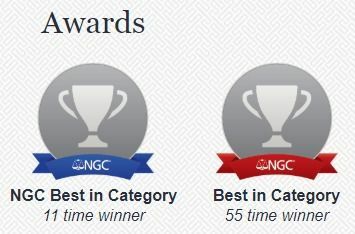 The Blue is "NGC Best in Category." This is given only in US Categories. It is given to the set with the highest score when looking only at NGC graded coins. Grandfathered PCGS coins don't count for this award. 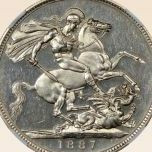 It has been awarded since 2012 - the year PCGS coins were removed from the World registry sets. This award is not given in World Categories as there are no non-NGC graded coins in World set categories anymore. If the same set wins when counting and not counting PCGS coins, it wins both awards in a US Category.